So. I am finally here. 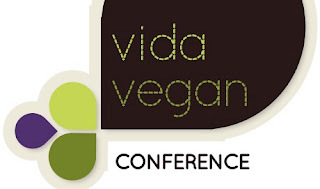 In Portland, at the VERY MUCH ANTICIPATED, first ever, super-exciting "Vida Vegan Con" Conference for vegan writers, bloggers, cookbook authors, recipe creators, cooks, chefs, and generally anyone who's excited about spreading the word about veganism, I think! Tickets sold out super-fast, and I was one of the lucky 200 or so that is attending this year's (the first of it's kind) event! I'm so very excited to meet so many of the people who I chat with on Facebook, Twitter and those whose cookbooks I memorize or photography skills I idolize. So much to learn and absorb! I'm SO psyched!! It's gonna be FUN!! So, though things don't officially "start" until tomorrow, tonight there was a "Meet and Greet", along with a screening of "Vegucated", a movie about three people who change their lives when they go vegan, (of course!). I didn't go to these pre-conference activities, (though by all reports these events were a blast!!) but spent the day playing "Vacationing-Vegan-Tourist" around Portland with my friend (and fellow conference attendee) Shaun. That said, I'll show you just a FEW of the amazing vegan food-things you can get here in the lovely City of Roses. I could drink this gravy, it's that good. And that's saying a LOT coming from me, as I pretty much own the vegan gravy world. Vita has soups, sandwiches, breakfasts, burgers, American diner food type stuff. And it's VEGAN! My main reason for stopping there though, (besides the gravy) is their vegan Bloody Marys. Yes, even your drinks can have animal bits in them. 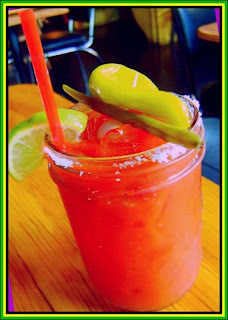 A traditional Bloody Mary has Worcestershire sauce in it. And Worcestershire has anchovies in it. Tiny smushed up little fish. Eeeww..
Making a traditional Bloody Mary NOT vegan. :cry:. But the ones at Vita are not only delicious and topped with, like, five pickled, salty, crunchy things; but they're served in a small Mason jar, reasonable priced, strong and vegan too. If I hadn't been so painfully full, the vegan Marionberry Cheesecake would have seriously tempted me. I considered take out for breakfast but decided to exercise SOME restraint. Then, today (after I slept like a dead person until 1:30 PM - vacation much?) we hit up my second-favorite Portland spot, Hungry Tiger Two. 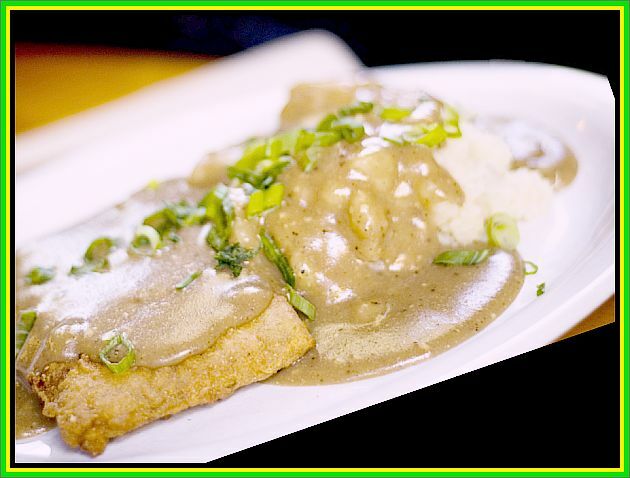 HT2 has an equally impressive run-down of classic comfort-food favorites (and their gravy is tasty, and quite edible, though not my favorite). 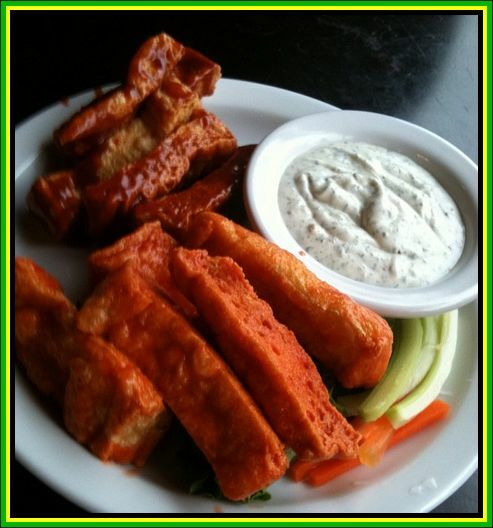 Hot wings gone vegan and so good you'll want to take them home and marry them. Seriously. They also come in "BBQ" which is good too, but the "Hot Wing" flavor was my fave! And even bettter, they're on sale on Thursday nights!! Shaun and I sat at the table and did the math... "How much could we spend and NOT look like complete vegan-gluttons?" Heehee. 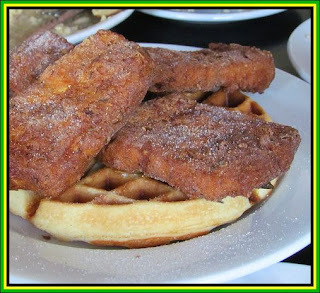 Shaun also ordered their tofu "Chicken and Waffle" lunch and we both thought the tofu and waffle were extremely good. (Almost as good as my waffles, which again, is saying a LOT!). Yes, there's more to do in Portland than just EAT. (Whatwhat?) We also stopped by Powell's Bookstore (they're hiring, hmmmm...), the waterfront, the Rose Gardens and several awesome fountains, just for fun. It was a BEAUTIFUL, warm, sunny day!! This concludes the whirlwind tour of Portland foodie-yumminess for the evening. Tomorrow I'll be blogging all sorts of Vegan Conference stuff, stay tuned!! I can't wait to read more about your experience there. I heard about it but couldn't do it this year. Maybe next year. Those Bloody Mary's look AMAZING! "Sorry for the lame iPhone picture." Really?! I should take such "lame" photos! All look scrumptious! Looking forward to more from VVC. I've always wanted to visit Portland and I definitely want to attend the convention next year!! Can't wait to read more of your adventures there! looks sooo good!! i was drooling over your Tofuffalo Wings twitter the other night!! looks like they freeze the tofu first for texture? do you freeze your tofu often? or for certain recipes?